Tickets for Sussex Sharks’ first home match of this year’s Vitality Blast against Surrey on Friday are sold out. This marks the fourth sold-out event in a row at The 1st Central County Ground following the Sharks’ one-day match against Australia on 7th June and the Lionel Richie and Little Mix concerts on 23rd June and 7th July respectively. Commenting on the run of sell outs, Sussex Cricket chief executive Rob Andrew said: “The 1st Central County Ground is a very special venue for all sorts of events and this is reflected by capacity crowds for both cricket matches and high-profile concerts this summer. “I’d like to thank everyone that has joined us so far and that will be joining us in the weeks to come for their support. “Looking ahead, it’s brilliant that our men’s team will be starting their home campaign in this year’s T20 competition in front of another sold-out crowd. Hospitality packages for Friday’s match, as well as for Sussex’s fixture against Kent Spitfires on Friday 10th August, are also completely sold out. Very limited availability remains for the visit of Hampshire on Sunday 29th July. 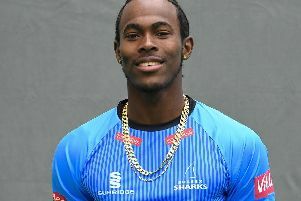 Those wishing to see the world’s number one T20 bowler, Rashid Khan, England internationals, Chris Jordan and Tymal Mills and global T20 stars, Jofra Archer and Luke Wright in action should secure their tickets for Sussex’s remaining home Vitality Blast matches without delay. Friday’s match against Surrey gets underway at 7pm, with gates opening at 5.30pm. No tickets will be available to buy on the night. Spectators without tickets can still watch the match thanks to the live video stream with full commentary from BBC Sussex on theSussex Cricket Match Day Centre. Remaining tickets for the rest of Sussex Sharks’ home Vitality Blast matches are available to buy now from www.sussexcricket.co.uk/tickets or by calling 0844 264 0206. Information on remaining hospitality packages is available here or by calling 0844 264 0206. If you would like to discuss holding an event at The 1st Central County Ground, please visit https://sussexcricket.co.uk/conference-events. *Calculations do not take into account the match against Glamorgan, as this took place at Arundel last year.